NZD traders - heads up for the GDT dairy auction coming up (Wednesday?). The Australian dollar dropped early in the session here from around 0.7220 down to under 0.7200. The drop came in response to a much worse than expected result for December retail sales (see bullets above). At the same time December trade data showed a larger than expected surplus, LNG continues to be a star but nevertheless, exports were down on the month. The boost to the surplus came from a sharp and broadly based fall in imports, likely not a healthy indication of the strength of domestic demand. Earlier in the session was a very poor indeed services PMI, but this data point tends not to move the currency upon release. After the drop AUD inched its way back to cover the 'gap' down on the data (I should note the rages up to this stage had been very small indeed). And so to the RBA. The Bank announced their first decision for the new year, 'on hold' as was widely expected. AUD/USD popped toward 0.7250 and as I update has poked its nose above there. Through the early part of the session NZD outperformed the AUD. 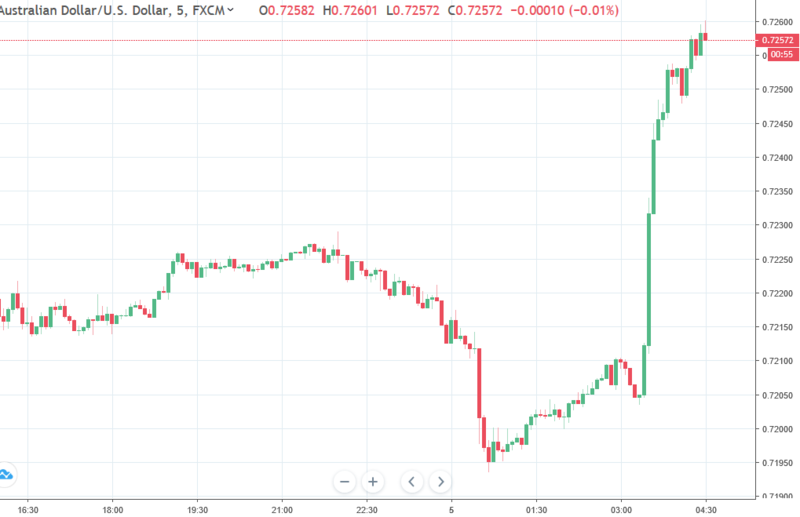 It lost a few points early alongside the weaker AUD but soon recovered to a fresh session high (data from NZ today showed the first rise in 8 months for ANZ's measure of export commodity prices). Elsewhere for major currencies action has been more subdued. China, HK, Singapore were all out on holidays today (and are all out again tomorrow). Expectations of 'falsh crashes' due to limited liquidity have so far proved unfulfilled. Gold gained a few $. Note in the comments above some US/China trade comments from the US Treasury, also from Fed (Cleveland President Mester), all with little impact on the session.